I created this recipe as a Thanksgiving first course, and now it’s something I enjoy throughout the autumn months. 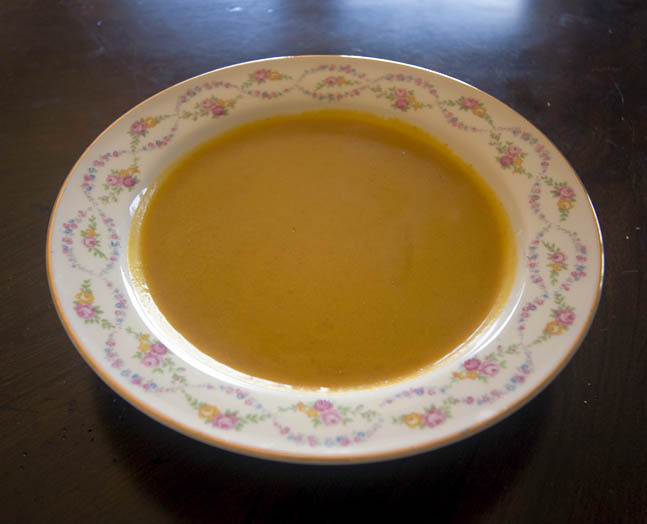 I find most pumpkin soups too savory for my taste, but this one is sweet and spicy…like pumpkin pie! Sauté the onion, carrot, and celery in butter until tender. Add 3 cups vegetable stock and bring to a boil. Reduce heat and simmer 15 minutes. Blend the broth and vegetables in a blender or food processor (or use an immersion blender) until smooth. Return it to the pot and stir in everything but the milk. Bring to a boil, reduce heat, and simmer 10 minutes. Whisk the half and half, and heat through.